The University of the Philippines’ College of Home Economics (CHE) celebrates its fiftieth yearwith the unveiling of over thirty selected pieces from the College’s costume collection with Sulyap saBaro at Saya: Silayan ang Saya de Kola (A Glimpse of Celebration and Dress). The exhibition is the firstvenue to show the most number of dresses from the collection initiated by Dr. Leonarda M. Jurado inthe 70s. Framing dress as science, technology and art, Sulyap sa Baro at Saya revisits as well the historyof the College and the development of Home Economics as a discipline. This is but a mere glimpse of ournation’s rich history and fascinating material culture. 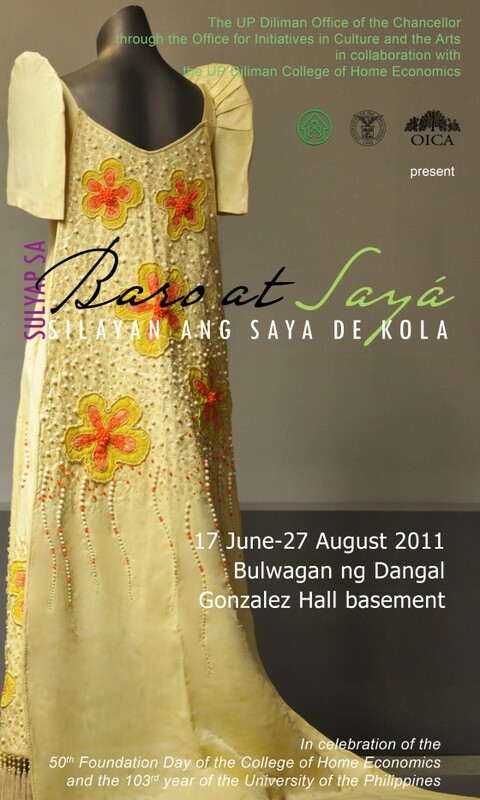 Reflecting the multi-faceted lifestyles of Filipinowomen over the decades, the collection will go on display at the University’s Bulwagan ng Dangal from June 17 to August 27, 2011, alongside paintings on loan from the Vargas Museum and the CHE library aswell as a sound piece designed by DJ Mark Zero. This exhibit is open to the public, a venue for discussionfor enthusiasts of costume, fashion, and local history.